This Thai kingdom held sway over territory from south of the Altai Mountains to the right bank of the Iang Joer or Yangtze River. Three important cities were Yung, Pa, and Yiw or Ngiaw. Existence of this kingdom is supported by Chinese history, which states that it began 4,500 years before the Buddhist Era (5,043 BC). 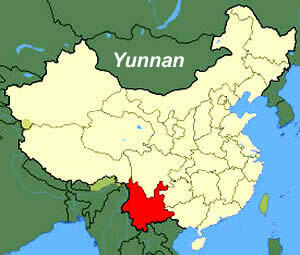 Yung was lost to the Taad or Mongolians; Pa was ceded to the Chinese. Ngiaw was taken by the Chinese at the beginning of the fourth century of the Buddhist period. At that time, the Thai lands were governed totally by China (This is to mean about 328 [215 BC] for this condition). The kingdom lasted some four thousand years. 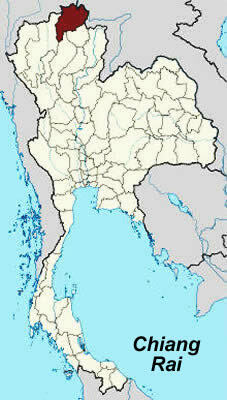 When the old state was occupied by China, most of the Thai migrated south -- away from the original kingdom. They collaborated in clearing the land to construct new homes about the year 400 (143 BC). A new land, Ai Lao [NOTE: Located in modern Yunnan province], was established by a junction of several peoples; a king ruled at this time, which might have been adopted from the Chinese. Two important centers were Phengai and Ngai Lao. The state continued only a little over 200 years before it was terminated by China in 621 (78 AD). Its length of independence was 221 years. The Thai race cherished freedom above all else; they possessed no desire to be dominated by another nation. As has been mentioned, they abandoned their motherland and emigrated through the vast southern forest and were silent nearly 500 years. This long period of solitude enabled them to become strong and develop an extensive stronghold. This kingdom began towards the end of the twelfth Buddhist century (seventh AD), being called Nan Chao. It was comprised of six large districts. King Sihanorabodi (Sinulo) combined those six states into one kingdom in 1192 (649 AD) and for a short while established friendly relations with China, their old rival. But contentions and dissension took over the populace; war was inevitable. A powerful army captained by King Kalhong (Ko Lorfong or Khun Luang Fa) battered the Chinese force of the Southern Kingdom, mauling them in numerous encounters. The Nan Chao chief led his Thai warriors forward, taking Ai Lao and part of Thai Mung. These areas were held throughout most of the seventh century AD, or in other words, until the Chinese emperor adopted a new foreign policy by firmly solidifying stronger ties of friendship than had previously existed; he gave his daughter to the Nan Chao heir. The result of this royal union was that Chinese territory conquered by Nan Chao was returned and Chinese were allowed to enter the Thai kingdom to homestead. They flowed into the land, finding both a livelihood and happiness which lasted until Khublai Khan, leader of the Taad or Mongols, brought a huge army which subjugated Nan Chao in 1779 (1236 AD). He also took the Chinese territory, meaning that both the Thai and Chinese lost autonomy simultaneously. Nan Chao was a power from 1192-1779 (649-1236 AD), or approximately 587 years. At the time Nan Chao was in power, Chaiphong or Saiphong, a son of Nan Chao's king, led a number of Thai to the southwest. He founded a city on the south bank of the Mekong River; in the thirteenth century (eighth AD) it was called Yonok Chiang Saen -- sometimes named Nakphan or Nakhent. The prince elevated himself to "king", but he remained subject to Nan Chao which was the mother country, until the fifteenth century (tenth AD). The kingdom of Nan Chao was then in a state of turmoil due to the occupation of China. The chief of Yonok Chiang Saen separated himself from Nan Chao's authority, becoming independent. The Chiang Saen kingdom retained its free status up to the start of the seventeenth century (twelfth AD) or until the Khmer armies invaded the city. The attack continued until the city fell, becoming a Cambodian tributary state for 20 years. Prince Phrom Raad or Phrom Chuman, son of the Chiang Saen king, led the Thai in salvaging their freedom from the Khmer Empire and destroyed them in Yang or Lanna Thai. The prince went on to begin the city Chai Prakan on the bank of the Fang River. He held this city in order to resist the continued Khmer incursions. Chai Prakan was started in 1661 (1118 AD). When the king of Nakphan or Nakhent passed away, only Prince Phrom Raad remained who could claim stay to the kingship. He changed his royal name to Phracao Phrom (king Phrom) and was distinguished and revered as "The Great". He did not establish himself in Chiang Saen, the old capital of the kingdom, but rather chose to remain in Chai Prakan. The capital was removed to Chai Prakan and the name of the state was changed to that synonymous with the principal city. Four important centers in the reign of Phrom the Great were Chaiburi Chiang Saen (which was Yonok Chiang Saen or Nakphanderm, the one King Phrom had changed the name of); Chainarai Muang Neng; Phang Khammuang Ning; and Chai Prakan, which was governed by the king also. He died in 1720 (1177 AD). His son, Prince Sirichai, succeeded him in Chai Prakan until 1731 (1188 AD). At that time, a large enemy force invaded; their fighting force contained Thai Yai (Great Thai), Man (Mon), and Taleng. King Sirichai, together with governors of the other three principal cities, gathered their strength to contend with their adversary. They were unsuccessful in their counter drive, being forced in the end to abandon all four cities, gather their families and flee. They demolished their homes before leaving Prakan for the south; a new enemy, the Khmer, was encountered. The Thai who fled from Chai Prakan at this time did not all stream out at once as on a previous occasion, but it was a migration specifically from the four central cities. Most of the other forty-odd towns did not flee because they were not assailed by enemy forces; a normal tranquility remained and their opponents but briefly occupied there. Once booty and prisoners of war were accumulated, the conquerors departed; for one thing, the enemy commander conducting the campaign against Chai Prakan was from a Thai tribe also, The Great Thai, which had beforehand left their original lands in China. They entered the domicile around the headwaters of the Mekong River, which was called "land of nineteen princes", quietly in the fifteenth century (tenth AD); they continued to multiply as the eighteenth century (thirteenth AD) dawned. Two twin Great Thai monarchs emerged: the older named King Khamfa or Suakhwanfa; the younger was called King Samluangfa. They resided in Saenwi or Seu. Both of these Thai rulers cooperated in subjugating Burma; an army was dispatched to obliterate Chai Prakan also. While the city of Chai Prakan and three other locations were demolished by their retreating governors, the king who mastered the land died. This encouraged nearly all the great and lesser towns of Chai Prakan to declare independence -- exception being those villages near the capital, whose fear of retribution directed their acquiescence in retaining tribute-paying status. This period might properly be called a time of city-state freedom in Lanna Thai. Several large cities were included among the new free states and there were chiefs or governors of three stable city-states. They were: 1) Hiran or Ngernyang [modern Chiang Saen] -- situated on the River Lawa or Lao, presently called the Mae Sai River (the city being more towards the north); 2) Phukamyao or Phayao -- located on the bank of the Khunphu River, now called Naming (it lay in the central region); 3) Hariphunchai -- found on the Namphing or Namku River (occupying the southern area). These three free cities were fully complemented in strength to maintain a balance of power. At the time King Sirichai led the families of Chai Prakan away, a governor named Laoming ruled at Hiran; he had ruled since 1717 (1174 AD). Laoming had been in power 14 years when Chai Prakan fell to the Saenwi armies and Sirichai fled from his adversaries. The governor of Ngernyang declared his freedom immediately. This ruler of Hiran was 22nd in line since the first governor and also was a direct descendant. The original ruler was Laochakarat, commonly called Laochok or occasionally Laochankrat. Laochok was a Lawa, followed by all the Lawa. One segment of this people settled in the vicinity of Doi Tung, in the midst of modern Chiang Rai province. At the time, this king of Chiang Saen desired to construct a chedi for harboring sacred Buddhist relics on Mount Tung and reserve the area encompassing the mountain as belonging to the temple. So Laochok gathered large sums of money and commissioned the selection of a new location within the kingdom. He brought his sons, wives, and courtiers to where a new city, Chiang Lao, was under construction. It was a Lao or Lawa city, controlled by Laochok. His dynasty remained in power until the ninth ruler, named Laokhiang. Laokhiang built Hiran in 1534 (991 AD), removing the capital there. His descendants ruled in Ngernyang without interruption up until Laoming, the 22nd in line -- known as the Dynasty of Ngernyang or Hiran. The founding of Chiang Lao by Laochok was fine, or the making of Ngernyang by Laokhiang was also good; both these sites very likely were raised many centuries before this period, which means the Lawa exercised dominance over the area before meeting a forced military capitulation by the Taland (Mon) or Khmer -- around 9th-10th century (3rd-5th century AD). Eventually these two centers and other cities of the Lawa tribe met disaster, stemming from invading Laman (Mon) and Cambodians until the city was deserted -- being rebuilt many centuries later. The building of Chiang Lao by Laochok, if one accepts the year 1534 (991 AD) for erection of Ngernyang, would be about 1231 (688 AD). During this time, various chiefs or governors of the free city-states attempted quietly to expand their territory and power and to retain the governing position for their heirs -- Hiran was similar to others. Laoming, 22nd governor in the dynasty, ruled 21 years before he passed away. His son, Laomuang -- 23rd in the dynasty, was sovereign 25 years. His death was followed by his son, Laomeng, 24th in line. He governed a long 40 years and died in 1802 (1259 AD). Laomeng's son, Prince Mengrai, succeeded to the throne after his father's death. Mengrai is counted as an outstanding chief, 25th of the Lawa dynasty at Ngernyang. This Lawa leader, Father Mengrai, of great prestige and authority, welded the various independent cities in the region into one kingdom called Lanna Thai; besides that, he founded Chiang Mai -- removing his court there, also. Two books narrate the account concerning the birth of Mengrai the Great. One states that it was on a Sunday, ninth day of the waning moon, first month (first lunar month) of the year of the pig in 601 (P.S. 1782; 1239 AD). Another chronicle asserts that it was actually on Sunday, ninth of the waning moon, third month of the year of the dog in 600; also claiming that he ascended to the Ngernyang throne in 1803 (1260 AD) at age 21 or 22. Phayao or Phukamyao, according to city archives, was built by Father Chomtham in 458 (PS 1639 or 1096 AD) and he continued to govern there. The Phayao records aver that he was the second son of Laongern, Laongernruang or Ngern, who was the 20th head of Hiran. Laongern beget two sons by his queen. The older brother was Laochin or Kunchin; his brother was called Chomtham. The king was concerned that the younger son would be left without royal possessions, so he divided his domain and charged his son to establish himself according to his pleasure. Chomtham conducted his retinue south to Mount Duan or Chomphu and to the River Saita, which is the River Ing. He saw the region was extensive and had a strategic site worthy of a city. A settlement was erected named Phukamyao or Phayao. Chomtham ruled there; therefore, succeeding kings were numbered with and called his dynasty. He had a son, heir-apparent, designated as Laochoeng the Great because he squelched kingdoms neighboring his. Chomtham reigned 24 years before his death in 1662 (1119 AD). Chuang, a prince of the dynasty who was relation to Chomtham through the kingdom of Yonok Chiang Saen, took control after the king. Up until the disruption of Chai Prakan, Keawianmuang (sixth from Chomtham) ruled Phayao. He was followed by Mingmuang, who died in 1801 (1258 AD). His son, Ngammuang, replaced his father as chief of Phukamyao, but in the following years Hiran and Phayao drifted apart, becoming a wide shrift. The populace enjoyed an independent status until in the end, the original dynastic tie was forgotten. According to statements in Hiran's legends, Mengrai led a foray against Phayao which was then (B.E. 1818 or 1275 AD) governed by Ngammuang. This evidences that the two brothers were unaware of their relationship. Mengrai was begotten by Chin or Laochin, elder son of Laongern or Laongernruang. (He was the older brother of Chomtham.) The lineage of Chin, 21st leader of Ngernyang, came from Mengrai, 26th prince of the city. 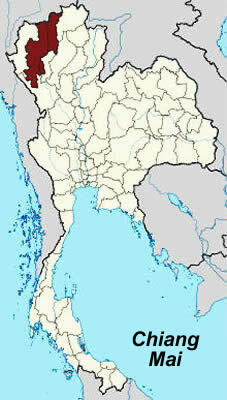 Phayao was from Chomtham to Nammuang, being only 12 successive monarchs. As for Hariphunchai, the original dynasty fell and during the many centuries later, several reigns had elapsed. Since this city's capitulation to Chai Prakan and until Chai Prakan collapsed, the Taleng tribe held sway over Hariphunchai; also, during the time Mengrai mounted to power in Ngernyang and while Ngammuang was Phayao's chief, Phayayiba of the Taleng ruled Hariphunchai. The city was considered more stable than either of the before mentioned places and it boasted more strength from the king's brother, Phayaberg. He was head of Khlaong; his son, Phayabon, ruled Ngao and was united with them, also. Of the three principal centers, only the chief of Ngernyang conceived the idea of merging the free cities into one single unit. Above all, he felt that was necessary and must be carried out. With that thought in mind, he amassed provisions and supplies until in 1805 (1262 AD) Mengrai constructed another new site on the Kok River, a large tributary of the Mekong River. The new town was christened Chiang Rai, meaning that it was the place Mengrai shifted to after leaving Hiran. From then on Ngernyang, built by Laokhiang as the seat of government in 1534 (991 AD), declined to an end in 1805 (1262 AD); it was the capital for 271 years. However, historians are of the opinion that the site where Mengrai built Chiang Rai is the location of Chainorai from Phrom the Great's kingdom of Chai Prakan. After that, Mengrai commenced solidifying the chief independent cities one or two at a time into his domain; he advanced to the cities as far north as the Khong River [Maekong] bank. Stubborn centers that refused to show submission were forced; such cities assaulted were Mob, Rai, and Chiang Kham. Their rulers were hurled from their positions and princes were appointed to rule in their place. This action struck fear into remaining obdurate towns. Leading centers yielded until all the north was subjugated by 1811 (1268 AD). The king turned southwest and constructed a village on the Chai River, calling it Fang. He rested his troops there, then assailed cities in the region until in 1819 (1276 AD) he fought Ngammuang, chief of Phayao from the Lawa tribe, who was also of the same lineage as Mengrai. Phayao's king did not make war with Chiang Rai by force of arms, rather it was resistance by a contest in dedicating holy shrines. In the end, Mengrai curbed his will against Phayao; a strong friendship with Ngammuang was made and he assured the Phukamyao king that he would not repudiate his word in the future about refraining from storming the city. In 1824 (1281 AD) Mengrai conducted an impressive army to Hariphunchai, which was held by the Taleng. The ruler, Phayayiba, marshaled stout resistance against Mengrai; all the Chiang Rai soldiers' abilities were taxed to the limit in order to secure the city. Their general ordered fire arrows to rain down on the populace's homes; soon fire spread throughout the city for days, overtaking the royal palace and consuming the homes. The Chiang Rai forces broke through. Phayayiba led his troops in retreat to a range of low mountains south of the city. When he saw the fire raze the palace, his grief knew no bounds. The range where he shed tears of sorrow over his city was called Mount Bahai -- today shortened to Mount Ba. Phayayiba traversed the distance to Khlaong; he dwelt with his older brother, who prepared a force to recover the seized capital. Mengrai resided in Hariphunchai two years; both years saw disastrous floods due to the lowlands. A transfer to the southwest of the seared city ended in building a new site (probably Wiang Pasang). Three years later saw Wiang Kum Kam (today lying in the midst of Saraphi district, Chiang Mai province) finished about 120 feet from the old palace. From Wiang Kum Kam, Mengrai waged two wars outside his borders. The first was a smashing of Hongsawadi [aka Pagan], the Mon capital, in 1831 (1288 AD). According to Chiang Mai annals, after a mere two years at Wiang Kum Kam, no skirmishes ensued from the Taleng because the Mon kingdom was torn by rebels and internal dissension. The Raman (Mon) chief presented a daughter (Tala Mese) to Mengrai. An invasion in 1833 (1290 AD) against Angwa was undertaken; the Burmese king concluded terms of friendship by sending craftsmen to Mengrai. Besides that, this Lawa chief swore an oath of allegiance to Ngammuang and king Ramkhamhaeng of Sukhothai also. Mengrai enjoyed several years' reign in Wiang Kum Kam; he made a pleasure tour in 1834 (1291 AD). Between the right bank or the Ping River and a range of mountains containing Doi Suthep, he beheld an exceptional location to construct a large city. An appropriate number of workers was sent to clear the land and raise temporary crew camps. When sufficient materials were gathered after a period of four years, he invited his two allies, Ngammuang and Ramkhamhaeng, to join him in consultation on laying out and constructing the city. As the two friends came and conferred on plans for dimensions, at first Mengrai thought to make a square city 12,000 feet long per wall or side. But the Sukhothai chief remonstrated, suggesting that Mengrai's blueprints called for too extensive an area. He called for a rectangle of: width east and west by 4,800 feet; length north and south by 6,000 feet. The Phukamyao prince supported the idea; Mengrai also agreed to it. He ordered it built according to Ramkhamhaeng's proposal and dispatched 90,000 workers, dividing 40,000 to rear a palace and residences for officials and another 50,000 to labor on erection of the walls. Work began in 1839 (1296 AD) and was over four months in construction. As the great propitious day came, Mengrai observed a ceremony commemorating his usurpation of power. He ascended the throne in the newly created city called "Nopburi Srinakhorn Ping Chiang Mai". After the proceedings were completed, the two allies returned to their respective capitals. Even though Mengrai had carved out the Lanna Thai kingdom, several important free cities such as Phayao, Kosai, and Nanburi remained beyond his control. Before Mengrai clamored into Hariphunchai and prepared to take Fang, he gave his son, Prince Khruang, dominion over Chiang Rai. Not long hence, he learned that the prince was thinking of rebellion. Therefore, he used a close friend (Kunong) to lure the prince to Fang. As Kunong began his journey, he ordered general Aifian, a crack archer, to lay in wait for the prince. The prince advanced down the route and died under the poisoned arrow of Aifian. The Yonok chronicle and that of Chiang Mai both mention that Phayayiba, king of Hariphunchai who fled from Mengrai to abide with King Phayaberg of Khlaong, was Phayaberg's father. But Buddhist records claim Phayaberg was a younger brother and prince of Khlaong, and that he drove an army against Hariphunchai to retrieve it at the beginning of the next year -- not waiting 15 or 16 years as Chiang Mai books state. In any event, the account of warfare terminated the agreement that prince Khram of the second generation received his father's permission to make war. Results of the fight were: Phayaberg lost his life; prince Khram took over Khlaong; and Phayayiba escaped to Sukhothai. All this caused Khlaong to fall under sway of Lanna Thai. Prince Khram was bestowed rank of Grand Marshal by his father and confirmed prince of both Chiang Rai and Chiang Dao. Mengrai had three sons. The first was Prince Khruang, who held Chiang Rai, but he died. His brother, Khram [Grama], replace him at Chiang Rai. Prince Khrua was youngest and given Phrao -- built by Mengrai in 1823 (1280 AD). Grand Marshal Khram accused his brother of adultery with one of the king's wives. Mengrai exiled the prince to Kongtai, peopled by the Great Thai (Thai Yai) tribe, though still under the power of Lanna Thai. This tribe observed the prince's royal station, so they constructed Nai and offered it to him. He took up the reigns and became royal prince to them in 1853 (1310 AD). After this, the chief of Lanna Thai waged no war or subjected free cities again. He passed away at Chiang Mai in 1860 (1317 AD) -- a life of 80 years; he was 25th king of the dynasty. Upon his death, the head counselor along with the Grand Marshal of Chiang Rai took over the throne. Mengrai held the position of Hariphunchai's head from 1802 to 1838 (1259-1295 AD) a period of 37 years. He ruled Ping from 1839-1860 (1296-1317 AD) or 21 years, totaling 58 years in leadership. King Chaisongkhram (Grand Marshal Khram) completed coronation procedures according to custom. After that, he offered his father's corpse to the holy flames. He reigned in Ping four months and then consigned the kingdom to his oldest son, Saenphu. When he had conferred the throne to his son, king Songkhram retired to Chiang Mai. He bade his son, Namthuam, to Fang before he left and sent his son, Ngua, to rule Chiang Khong. Chaisongkhram's action in elevation of his oldest son to Ping at that time meant two monarchs ruled simultaneously. The older son resided at Chiang Rai; the younger in Chiang Mai. Let us speak of the Prince of Nai or Prince Khrua, youngest son of Mengrai, who was exiled to the Great Thai region. He learned of his father's death and saw an opportune time for insurrection to usurp the Ping throne. He marshaled his troops and advanced directly into Ping in 1862 (1319 AD). King Saenphu perceived his brother's designs but refrained from offering even the least resistance; he fled to Fang. Prince Namthuam sent his older brother along to Chiang Rai to inform his father. Prince Khrua of Nai removed his force to Ping. He was extremely delighted at lack of mustered opposition. He entered Chiang Mai and declared himself king. King Chaisongkhram learned of his brother's usurpation. He was provoked into ordering Prince Namthuam of Fang to organize the warriors and train common folk to be well versed in warfare. By 1863 (1320 AD) orders came to descend on Khrua to smash him. Prince Namthuam led his army comfortably through Phrao and Chiang Dao because both rulers despised Khrua. They withheld information to Khrua about the approaching host. The Fang commander secreted his troops around the city at night. They were received into the town by citizens who opened the gates. Khrua's Great Thai warriors were unable to offer lengthy resistance before turning tail for their motherland. Prince Khrua was locked up. King Chaisongkhram was pleased to know of his son's achievement in capturing Prince Khrua. He had intended to mete out just vengeance to his youngest son, but upon arrival in Ping, he had not heart to level strong measures against Khrua -- only kept him locked up. King Chaisongkhram conducted a ceremony to coronate Prince Namthuam as Prince of Chiang Mai -- reward for his action. The king returned to Chiang Rai in 1854 (1321 AD). King Namthuam ruled in peace until in 1867 (1324 AD). King Chaisongkhram dispatched the governor of Khong to seize the Ping chief and transport him to Chiang Rai. Warning was issued that Namthuam was considering rebellion; however, no investigation was taken to find if the charge was true. He was exiled to Kemrad (Chiang Tung) [modern Kengtung in Burma], a city on the kingdom's outer edge. In 1867 (1324 AD) Prince Khrua died in prison. King Chaisongkhram committed the corpse to the royal crematorium after he heard of the death, and he combined it with elevating his son, Saenphu, to power in Ping. Chaisongkhram then retraced his way back to Chiang Rai, where he ended his life in 1870 (1327 AD). He was born in 1808 (1265 AD) and lived 62 years. Saenphu bestowed Chiang Mai to his only son, Khamfu, and oversaw the cremation ceremony of his father at Chiang Rai. He resided there until 1871 (1328 AD). He had a new city (according to Yonok and Chiang Mai annals) constructed on the Mekong River; however, some archeologists claim it was on a small Mekong tributary. The city was christened Haran Nakhornchaiburi Sri Chiang Saen or shortened to Chaiburi Chiang Saen. Saenphu completed and ruled from there until his death in 1877 (1334 AD). Yonok records state he died at age 60. When Khamfu learned of his father's immediate death, he placed his dominions into his son's hands (Phayu). He then took charge of the royal funeral and placed the body in a shrine, burying it at the mouth of the River Mekok rather than cremating it. He returned to rule at Chiang Saen. In 1881 (1338 AD) Khamfu entertained notions of subjugating Phayao, but remained in awe of its strength, so he encouraged aid from Nan, with promise of a half share in the booty. The king endorsed the proposal, leading an army personally. Khamfu commanded his army in person also. Both forces struck almost simultaneously and scattered the defense. Khamleu was king at the time, being 14th in line from Chomtham or 3rd from Ngammuang. Lanna Thai troops entered before those of Nan, gleaning loot and captive by themselves and refusing to share according to the agreement. The Nan monarch was furious. He sent his warriors storming Khamfu's lines. The Lanna Thai force was incapable of withstanding Nan's prowess. They took flight to Chiang Rai, followed hotly by Nan troops. Fang was taken, yielding much wealth and a great number of prisoners. The Lanna Thai chief assembled a huge force, which drove the Nan troops back to their lands. Khamfu returned to Chiang Saen. Lanna Thai's king struck for Phrae, another free city, in 1883 (1340 AD). Phrae presented a stubborn defense. The Ping army could not crack Phrae, so it withdrew. In 1887 (1344 AD) Khamfu visited Wiang Chiang Kham (now located in Chiang Kham district, Chiang Rai province) and remained there one month. One day he drowned in Mekham stream as he was bathing. He died at age 47, having ruled 22 years. The chief counselor brought the body to Chiang Saen and sent word to Phayu at Ping. The "Holy Gems of Wisdom" named him Wahariparawakuman. King Phayu allowed his oldest son, Ken or Kilna, to preside in Ping, then he went to Chiang Saen to cremate his father. He brought the residue back and raised a chedi over it; it lay 600 feet outside Suan Dok gate. In 1888 (1345 AD) he built a monastery called Wat Phra Chiang; later the name followed that of the nearby market of Lichiang. The Phra Sing (a sacred Buddhist carving) was housed there, so people referred to it as Wat Phra Sing -- it being designated in like manner today. Phayu reigned in Chiang Mai and sent Keuna to Chaiburi Sri Chiang Saen and he ordered his youngest son, Maha Phrom, to Chiang Rai. But both of those centers had declined in importance since Phayu's removal of the government to Chiang Mai. No other king ruled from either of those two cities again. Phayu died at age 57, having ruled 28 years. This king was known by three different names, being: according to Chiang Mai annals -- Phayu; by the Holy Books -- Honyu; and Tayu the Great by Wat Phra Sing. The chief advisor, together with Prince Keuna of Chiang Saen, ruled Chiang Mai according to traditional custom. Phrom, a younger brother, was given three cities: Chiang Rai, Chiang Saen, and Fang (which had not previously been numbered with the other two). In Mengrai's time, only the first two were given to the Northern Prince. Phrom alternately resided at both centers. The Yunnanese required a gift of 594 tons from Lanna Thai, but it is unknown why or when it was delivered to their king; or again, whether it was husked or unhusked. Actually, the government records of Keuna did not specifically mention payment of the demand, but said, "The Ha (Yunnanese demanded a gift of 594 tons of rice." They menaced Chiang Saen in 1913 (1370 AD). In the midst of Keuna's third year as monarch, Phrom summoned for a competent captain and gained a victory.